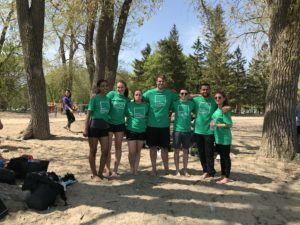 Upon arrival at Cassels, all of us Summer Students were each assigned a Student Committee Mentor and a Firm Mentor to help guide us throughout our summer experience. While many firms may have mentorship programs, we wanted to share with you a bit about our mentorship relationships to date and why we think the mentors at Cassels are particularly great. Moral of the story: The mentors at Cassels are no joke. They are always willing to help, are friendly and approachable, and driven to help you succeed. If you want more information on the mentorship programs at Cassels, feel free to reach out to any of the Summer Students with questions about their personal mentor-mentee relationships. 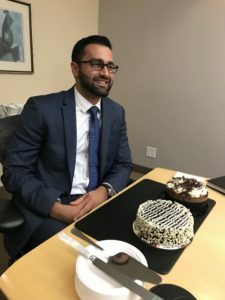 Last summer, I did a lot of phone conversations, and a lot of coffee dates with summer students from law firms in Toronto. My body is still recovering from the caffeine overdose I put it through. This is the post I wish I had last year before embarking on a journey that left my mouth dry and my cheeks cramped. Here are the ins and outs of how to handle the phone calls and coffee dates that are unfortunately inevitably in your future. You’re not alone, phone calls scare me too. Actually, it’s the potential for long awkward pauses that scares me. Anyway, you don’t need to worry about that, because that’s not going to happen after reading this post. That’s right, this post is long awkward pause proof. The key to avoiding awkwardness, and more importantly, standing out as a prospective student is to be prepared for the phone call. While you may think your memory is infallible, I’m here to tell you it’s not and that a pen and paper are your friend. These phone conversations are for your personal benefit, so you want to ensure you get the chance to ask every question you intended. If you rely solely on memory, you risk missing out on valuable information and honestly, most likely (not speaking from experience or anything…) you’ll end up asking the same question 5 different ways. I consider this to be a skill – others, not so much. To help you out, we have compiled a list of meaningful questions to ask summer students so you can save your creativity for another day. And no, if we’re on the phone and I notice you’re just reusing these questions I won’t judge you. If anything, I’d be flattered. What does a regular day look like for you as a summer student? What type of work have you had the opportunity to try? How do students get their work – list-serve or going out and getting it? What types of student events are held throughout the summer? Do you find that your mentors (if the firm has a mentorship program) have helped you throughout the summer? What is the environment like between the students – collegial, competitive? Why did you apply/choose the firm you’re at? Have you had the chance to go outside of the office “in the field” with lawyers at all? What were you nervous about when you first started work? How do you feel about that now? While these are obviously just a warm-up, hopefully it helps to get the juices flowing. If I have one piece of advice it would be to ask questions about what matters to you. No topic is too taboo, or too controversial for our ears. If you approach the questions professionally and thoughtfully, we’ll appreciate your candidness. Also, don’t feel self-conscious about your questions. I remember thinking to myself that the student must’ve heard these questions a million times. Even if we have, if the person is enthusiastic, engaging, and easy to talk to, that’ll often overshadow the rest. I didn’t ask their permission, but feel free to reach out to any of us students at Cassels this summer. We’re all unhealthily slightly obsessed with the firm and would love to chat about it. It’s that special time of year again…. The season of the Summer Open House! Many firms will be opening their doors to students across the country this summer and just the thought of that can be terrifying. Never fear – CBB Blog Team is here. This post aims to demystify these events, including what to expect, what to gain, and how you can make a positive impression. So, what is a Summer Open House? Many firms host an after-work session around 5pm which often involves networking, wine, and hors d’oeuvres. Often, these events begin with a few lawyers, the recruiter, and/or student committee members telling you about the firm. This normally takes the form of a presentation at the front of the room while the students are seated. This is followed by a networking session in which lawyers and the firm’s students are scattered throughout the room happy to chat with you about their experiences. Other firms may host their Open House over the lunch hour from 12-1pm, normally with food served. From the events I attended last year, the lunch sessions involved a panel wherein lawyers and some of the firm’s students would answer questions about their experiences to date and offer advice for the upcoming 2L recruit. This is the format of Cassel’s Open House, both on July 12th and August 16th this year. At Cassels, you will have the opportunity to hear from a number of lawyers from the Student Committee, and current Summer Students. Following our panel, open networking will take place whereby you can ask us your questions individually and try to get a better sense of what Cassels is like (answer: it’s awesome)! Of course, there is the hope and possibility that attending these events will get your name out there and allow you to meet the recruiter and hopefully stand out in a positive way. But arguably more important than that is the information that you can gain from an open house. Be engaged when listening to the panel or presentation. It is likely the case that many of your initial questions will be answered by the speakers. Tip: It is best to avoid asking lawyers or students in the networking portion of the event questions that were already answered. That being said, no need to stress or take notes furiously scribbling down every word that is said. Definitely take notes if you want to, but know that it is completely optional. I found what worked best for me was paying full attention to the presentation or panel and speaking to as many people as I could at the event, then taking notes on my phone afterwards. For instance, I would often write a note or two about what a student said made the firm unique or why they chose to work there. These are points that you may find useful when drafting your cover letters. Tip: Never underestimate how short your memory can be. It is probably wise to take notes as soon as possible so that you don’t miss out on key details such as the names of those you spoke with. You may want to drop a name or two in your cover letter (assuming they sparked your interest in the firm), but you also may want to follow up with these people in the future. Grabbing business cards is an easy way to help jog your memory. You can also look at these events as an opportunity to learn more about law in general, different practice areas that may fascinate you, or what it is like to work at a firm of that size. These are all things that may inform decisions like what kinds of courses you pick next year at school or whether or not you decide to apply to boutique vs. full service firms, global vs. national firms, small vs. large firms, etc. A final take-away of these events is the opportunity to solidify a connection with a potential mentor. Whether or not you end up working at a certain firm, it will benefit you to have a few mentors in the industry who can help guide you throughout your career. Of course, wherever you end up working, you will likely find more mentors, both through formal mentorship programs and informally. But to have mentors at various firms can never hurt you. If anything, it will allow you to hear from a variety of perspectives when it comes time to pick your summer or articling rotations (if applicable), and eventually your practice area. The people you meet at open houses are all great contacts to have and you may end up working alongside or across from some of them in the future. What should or shouldn’t I do at an Open House? Try to be as engaged as possible from the moment you step foot in the firm to the moment you leave. As a guest of the firm, be sure to thank the host (likely the recruiter in this case) for inviting you to the event. The questions you do want to ask at these events however depend on what you are interested in learning. I was always interested in knowing how students made up their minds about firms in the recruiting process so I would often ask why they chose to work at that firm, as well as if they have any general tips for the recruiting process. Don’t fret too much about the questions you ask though. The most important thing is that you take something away from your time there and try to get a sense of what the firm is like. When you leave, you should ask yourself: Could I see myself working there? Could I relate to the people I talked to? Were any of my interactions awkward or unpleasant today or did everyone seem like someone I could work with? What if I can’t attend an Open House? Don’t worry if you can’t attend an Open House or any of the open houses for that matter. Many students will be unable to attend and that’s totally okay. 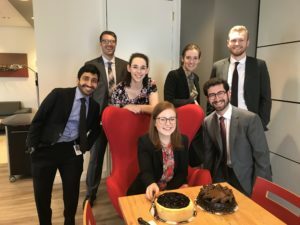 If you want to make up for it though and still be able to get a sense of the firms before the interview process begins, you can always reach out to a few of the firm’s current summer students, articling students or lawyers, and request a quick phone call wherein you can ask them questions. None of these things will be completely determinative of whether or not you will be hired, so again, don’t worry. Tip: The process will not be identical for everyone so don’t concern yourself with how your peers network or how many events they are attending. Do what you can and do what works best for you. If you have any questions at all, please do not hesitate to reach out to any of the current Summer Students. We would be more than happy to speak with you about our experience thus far at Cassels or give you general tips for the upcoming 2L recruit. Best of luck, and may the odds be ever in your favour. There are a lot of things to look forward to when you work at a firm – going home at midnight, getting an assignment from a lawyer at 4pm on a Saturday, or receiving a memo back you thought you nailed covered in red pen. While those are all exciting things to look forward to (at other firms, of course), here at Cassels, we look forward to Wednesdays. We know what you’re thinking – Wednesday? What good ever happens on a Wednesday – it’s too far from the previous weekend to reminisce but too far from the upcoming weekend to talk about all the plans you’ve already made. As you’re having this mid-week crisis in your head, your stomach grumbles. Now, not only are you faced with the mid-week blues, but you’re starving on top of it. Then there comes the next struggle – do I eat the lame carrots and dip I packed for lunch because #cleaneating or do I venture down to the PATH to find something delicious AND healthy with my friends and ignore the voices in my head saying, “STOP spending money”. This dilemma occurs to all summer law students. Correction: This dilemma occurs to all summer law students, EXCEPT those at Cassels. On Wednesdays, Cassels caters lunch for all of the lawyers at the firm, and honestly, it’s delicious every time. To be honest, I don’t have anything else to say. It was a lot of build up for one sentence. Okay, I’ll say it again, but this time I’ll bold and underline it. Cassels caters lunch every Wednesday. Remember in elementary school when your teacher designated 15 minutes every afternoon to snack time? Yeah, Cassels does that too. Every day at 4pm, well, 4:07 if we’re being polite, the Cassels Summer Students file into the lounge for daily snack time! It sounds minute, but when you spend your entire day doing Due Diligence, or spinning your wheels on Westlaw, a delicious break is needed, and appreciated. Okay, two more very quick headlines on the food topic, since we’re here. Is it presumptuous of me to think lunch will be served? Ugh, but if lunch isn’t served I have to make it myself. What if lunch is served but I make a lunch and my food goes to waste? Erin, just leave the food you made in the fridge for the following day – problem solved. Wow, that really wasn’t hard to figure out. Now I just need to decide if I bring my lunch to the CLE or not – how presumptuous do I want to seem? Many a thoughts for nothing, as lunch was served. Crisis averted. Lastly, but honestly, probably the most important food tip of the day. Birthday parties aren’t just for kiddos. I really lucked out with the group of Summer Students this year. No, not because of their dazzling personalities (although that’s a close second), but because there are so many summer babies – which means Birthday Party!! Seriously, we get a calendar invite when it’s a student’s birthday entitled, “_____’s Birthday Party” where we all go to the lounge and eat cake. Cassels Brock & Brockwell: Where you’ll always be learning, but never be hungry. We’re not saying that food should be the reason you pick a firm, but it definitely shouldn’t not be a reason you pick a firm, either. 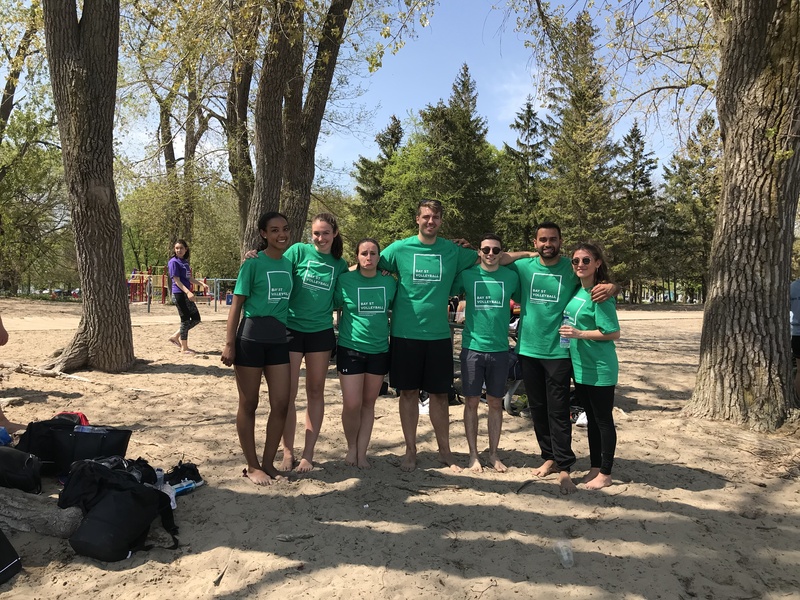 On Wednesday, May 23rd, a group of Cassels Summer Students made their way to Woodbine Beach for the yearly tradition that is Bay Street volleyball, donning their team shirts and slapping on sunscreen for a day of games in the sun. The morning started with some easy wins against McCarthy and Torys to warm up the team. However, the afternoon got heated, with Cassels taking a close win against the massive roster of Stikeman-Elliot. By the fourth game, Cassels was joined by the fresh faces of students who had worked in the morning. The final game of the round robin was a nail-biter, with the Cassels team coming back from a 13-point deficit to beat Faskens 37-35. Undefeated in the round robin, Cassels went into the quarter-finals matching up against their old rival, Stikeman-Elliot. Unfortunately, a day in the sun and a limited roster had taken its toll on the team, while Stikeman’s seemingly infinite amount of subs ended up making the difference. Despite a close game, Cassels ended their run with a 21-19 loss and closing out the day with a 4-1 record. Leaving the field a lot sandy and a little salty, the Cassels student team retired to Biermarket with the students from the other firms for an evening of celebration (and mourning). 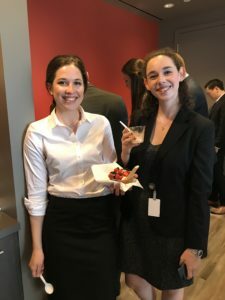 That night was spent celebrating with firm-sponsored drinks and food, mingling with the other firms and learning about other summer student experiences on Bay Street (tip: it isn’t as fun as Cassels). Until next year, Cassels will have to wait for a new batch of students to bring home the championship title to suite 2100 of the Scotia Tower.